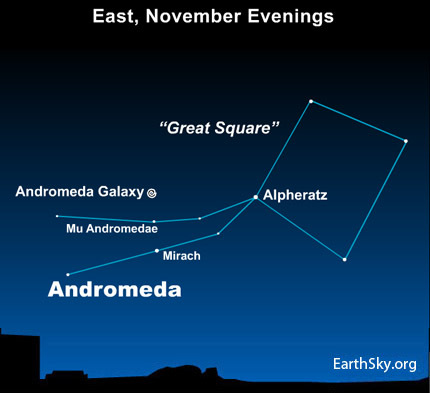 You can see the Andromeda galaxy at this time of year … simply by looking eastward at nightfall. By late evening, this galaxy will climb almost straight overhead, so you might want to enjoy the comfort of a reclining lawn chair for viewing this deep-sky treasure. This neighboring spiral galaxy appears in our sky as a large hazy patch – bigger than a full moon. It’s very noticeable in a star-filled sky, far from city lights, on a night when the moon is down. If you need some help finding the Andromeda galaxy, there are a couple of different ways to use neighboring constellations to find it. One way to find the galaxy is by finding the Great Square in the constellation Pegasus. The Great Square consists of a large square pattern of stars in the east at nightfall. By mid-evening, the Great Square swings way up high in your southern sky. Extending from the Square, you’ll find two graceful streams of stars – another constellation, Andromeda. I learned to find the Andromeda galaxy by “star-hopping” from the star Alpheratz in Great Square to the two stars marked here – first Mirach, then Mu Andromedae. An imaginary line drawn through these two stars points to the Andromeda galaxy. If you can’t see the Andromeda galaxy with the unaided eye, try binoculars. However, I said there were a couple of ways to use neighboring constellations to find the Andromeda galaxy. You can also find this wonderful galaxy using the constellation Cassiopeia.